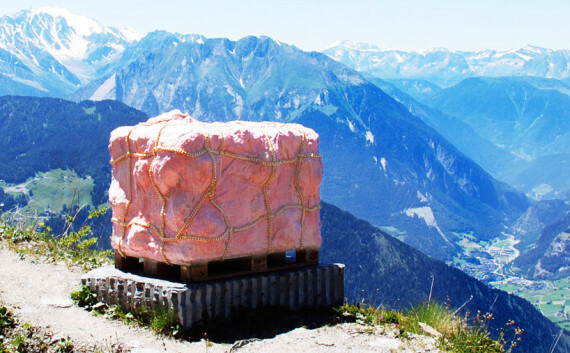 Today in the word of grotesque yet oddly intriguing artworks, we humbly present this giant flesh cube atop a Swiss mountain. The massive hunk of faux organs is the latest artistic creation from Swiss artist Andrea Hasler. Don't you wish more tourist postcards looked like this? Hasler crafted two site-specific sculptures as part of a six-week artist residency in Verbier at Switzerland's 3-D Foundation. The uncanny cubes comment on the excessive luxury tourism industry that swallows the Swiss mountains up during the winter months. 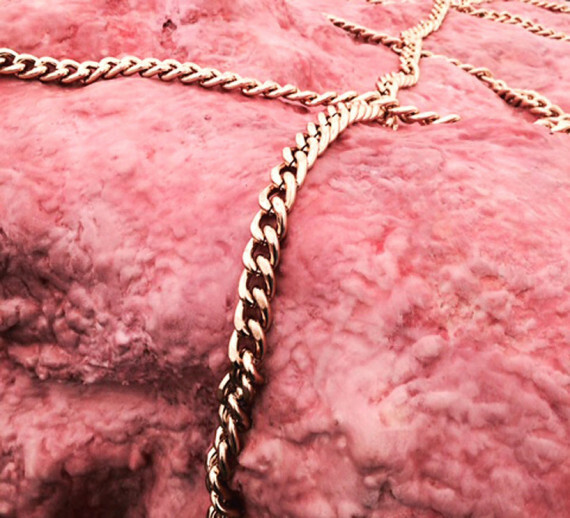 To depict the sudden change in the population as well as the atmosphere, Hasler plopped two fleshy forms onto the landscape, both wrapped in luxe gold chains. The juxtaposition of sleek gold bling and gloopy pink insides mimics Hasler's masterful meshing of attraction and repulsion. The chained up cubes also recall the emergency aid food pallets dropped in disaster zones, a dark foil to Verbier's elite jet setters. Although viewers have speculated that materials like chewing gum and meat are responsible for Hasler's nauseatingly realistic sculptural works, it's actually wax that gives them that spine-tinglingly human quality. Somewhere between Madame Tussauds' wax figures and fast food's pink slime, Hasler's chewed-up and spit-out insides are most certainly not for everyone. But if you get a sick satisfaction from that particular kind of nastiness that keeps your stomach turning and your eyes peeled, Hasler's human geometry will certainly do the trick. The artsy innards will be on view until July 5, 2016 in the Swiss mountains. We sure hope we didn't spoil anyone's plans to visit a Swiss luxury resort in the near future. Check out our previous coverage of Hasler's gutsy creations here and preview a clip of video installation "Avant/Après" below.